The month for the brightest festival has arrived. In all the festivities we celebrate; Diwali has a way of lighting up everyone’s heart with fun, laughter, sparkles and mirth. It’s time to gear up and make your home festival ready. 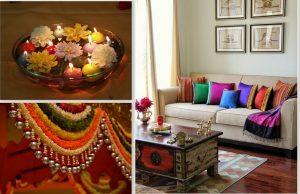 We have a few ideas for you that can absolutely dazzle your Diwali home décor. Cleaning is an important part of Diwali decoration as Lakshmi, the goddess of prosperity brings her blessings to houses that are clean and comfortable. So clean every corner of your home and make it completely clutter free. Clean your old and dusty furniture, remove spider webs from every corner of your home, clean the ceilings, electrical fittings such as air conditioners, wall lights, ceiling fans, floors etc. to get a complete clean look. 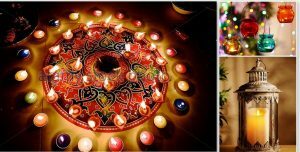 Have a colorful large Rangoli in the doorway of your house and make it brighter and more beautiful by placing earthen Diyas around them. Place candles and diyas on your exterior walls. If you have a garden, hang candle holders or lanterns in your garden and give an illusion of hanging lights. Adore your living room with a large earthen or glass pot filled with water, floral petals and floating candles. Hang candle lights at different heights to add the ethnicity to your rooms. Use garlands to decorate the doors of your rooms. Change curtains and cushion covers with bright color materials. Give a spiritual look with photos of gods and goddesses in your rooms. Diwali is a festival of lights; brighten your home with lights and joy. Give your best in decorating your home and fill the ecstasy of happiness into every one who visits your home. Different types of Wardrobes Designs ! !